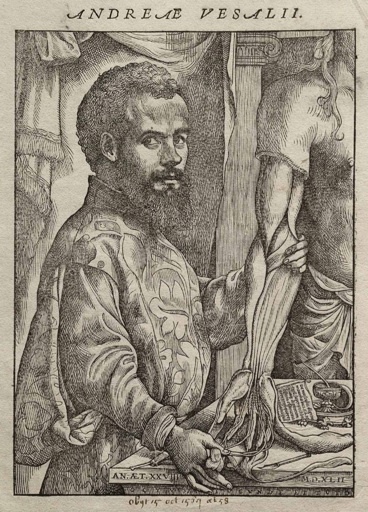 Andreas Vesalius (1514 - 1564) was a Flemish doctor who was a pioneer in medicine. He is regarded as the founder of modern anatomy. Totally in the spirit of the Renaissance, Vesalius made great efforts to stimulate a rebirth of the science of medicine. His efforts went well beyond a mere renaissance of ancient practices. He questioned the wisdom handed down from antiquity and turned away from established methods of teaching. Vesalius focused on generating and disseminating discoveries based upon his own observations and methods. Challenging tradition and the authority of the Church, Vesalius dissected corpses and thereby established a new level of clarity regarding anatomy and the internal connections of the human body. In this way, Vesalius questioned and amended the previously unquestioned validity of traditional wisdom. Between 1539 and 1542 he developed a comprehensive textbook of anatomy comprised of more than 600 pages with the title, “De humani corporis fabrica” – “On the Structure of the Human Body.” This volume, published in Basel, is regarded as a foundational early modern work in anatomy and a masterpiece of the art of book publishing in the early modern age. Andreas Vesalius was the founder of modern anatomy; he questioned the old teachings and built upon his own observations – and he created a beautiful book: these are three good reasons to choose his name to invoke as the historical symbol of the Vesalius Training Institute (founded in 1996) and the Vesalius Publishing House (founded in 1998).